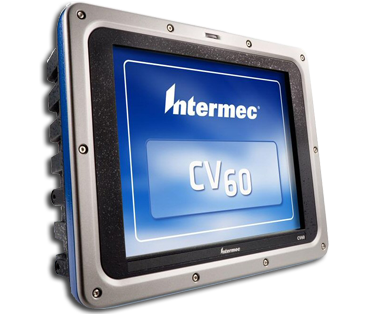 Continuing Intermec’s legacy reputation of developing reliable terminals, the CV60 computer excels in the most adverse environments with full PC functionality. The CV60 terminal, either fixed or vehicle mounted, puts wireless supply chain management right where the data is—at the dock, on the warehouse floor, in the trailer or in the yard—for the toughest material handling applications. The CV60 offers choices of either wired or wireless accessories. By integrating Bluetooth™ technology in the CV60, the user has fewer accessories to install, cables to contend with and tethered wires to get in the way. This eliminates costly cable replacement and improves user satisfaction and supports Intermec’s Bluetooth line of printers and hand held bar code scanners. The modular design allows for the convenient swap-out of hard drives. By integrating dual-diversity antennas, mounting of the CV60 is streamlined. This industry-leading design also provides seamless network connectivity within the Enterprise. This saves time, lowers the cost of overall ownership and permits on-site personnel to upgrade hardware quickly and efficiently.